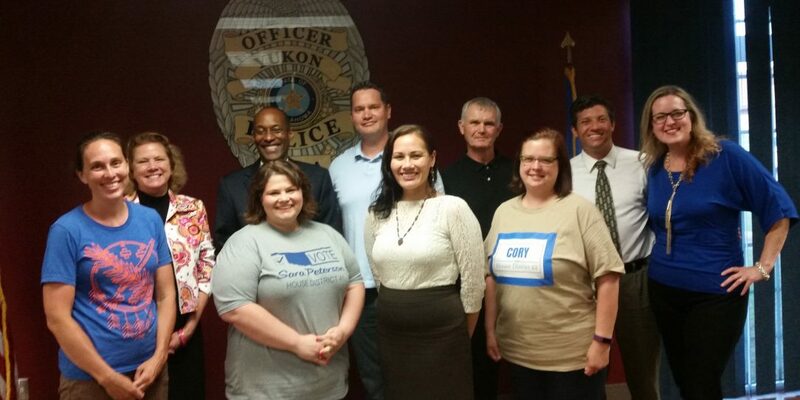 Caption: Eleven Democratic candidates and one Independent candidate spoke July 11 to a packed house at the Yukon Police Department: (first row from left) Jennie Scott – House District 41; Sara Peterson – House District 41; Ashley Nicole McCray – Corporation Commission; Chantelle Cory – House District 43; (second row) Jacque Pearsall – House District 43; Mark Myles – State Attorney General; Tyler Smith – House District 41; Daniel Pugh – County Commissioner; William Andrews – Senate District 22; and Sarah Carnes – House District 47. O. A. Cargill – House District 47 candidate – is not in the photo. YUKON, Okla. – More than 50 Democrats came Monday, June 11, to hear 11 Democratic candidates speak at a forum organized by the Canadian County Democrats. Andy Moore, the popular founder of Let’s Fix This, followed the candidate forum with information about grassroots efforts to encourage regular, everyday citizens to engage with their government. Other recent candidate forums in Canadian County have invited candidates for only one race. However, two statewide candidates and seven of the eight Democratic candidates running for House and Senate seats in Canadian County attended the forum Monday night. Senator Michael Brooks (Democrat – Senate District 44) was elected to represent Mustang and south Yukon in a special 2017 election. Brooks did not draw a Republican opponent in 2018 and has already been declared the winner in that Canadian County race. Voters who are registered as Independents can vote in the Democratic Party primary and runoff elections in 2018 and 2019. Voters may register to vote at any time; however, the deadline has passed to register to vote in time for the June 26 primary election. Wed, June 20, 2018 Deadline is 5 p.m. to apply for an absentee ballot (to vote by mail). 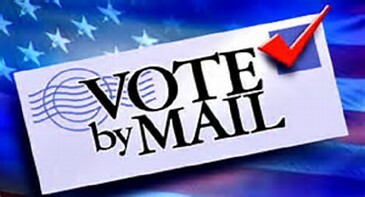 Apply for an absentee ballot online. Early voting will be available at the County Election Board at 200 S. Bickford Avenue in El Reno. • Thur, June 21, 2018 – 8 a.m. to 6 p.m.
• Fri, June 22, 2018 – 8 a.m. to 6 p.m.
• Sat, June 23, 2018 – 9 a.m. to 2 p.m.
Tue, June 26, 2018 Primary Election. Polls will be open 7 a.m. to 7 p.m. Voters are encouraged to complete provisional ballots if they have problems voting at a polling place. After Election Day, County Election Board officials will investigate and either approve or reject those provisional ballot. The Oklahoma State Election Board’s Online Voter Tool will help voters confirm that they are registered to, find polling locations, track absentee ballots or view sample ballots online. The Canadian County Democrats regularly meet on the second Monday of each month (except December) at the Yukon Police Department at 100 S. Ranchwood Boulevard. Contact hwinc@cox.net or 405-326-3600 to get involved in the Canadian County Democrats’ events and activities.